World-renowned mezzo-soprano Alice Coote joins forces with leading pianist Christian Blackshaw for a heartfelt exploration of the human soul in love. Coote�s sensitive and transfixing interpretation of the texts, coupled with Blackshaw�s intense and elegant musical expression, bring unique insights to this sublime collection of Lieder. From the passion of �Widmung�, �Du bist wie eine Blume� and �Die Lotusblume�, to those jewels of the Lieder repertoire, Frauenliebe und �leben and Dichterliebe, these kaleidoscopic explorations of love are captured live in recital at Wigmore Hall. Most of the music on this marvellous recital disc of Schumann Lieder dates from 1840, the miraculous 'year of song', when the composer finally married his beloved Clara. Mezzo-soprano Alice Coote and pianist Christian Blackshaw delve into the hopes and fears of love without the least hint of artifice, effortlessly combining classical poise and romantic passion. They open with a bouquet of largely flower-themed songs, including three from the Myrthen cycle, op.25, that Schumann composed as a wedding present for his bride. Whether in the animation of Friedrich R�ckert's Widmung, the jauntiness of Burns's 'O my Luve's like a red, red rose' or the rapt intensity of Die Lotosblume, Coote and Blackshaw trace the most subtle nuances of text with complete naturalness. In the later Meine Rose (1850) you can actually feel the heat that causes the eponymous flower to wilt. From the opening selection, Coote and Blackshaw progress to two of Schumann's greatest song cycles. 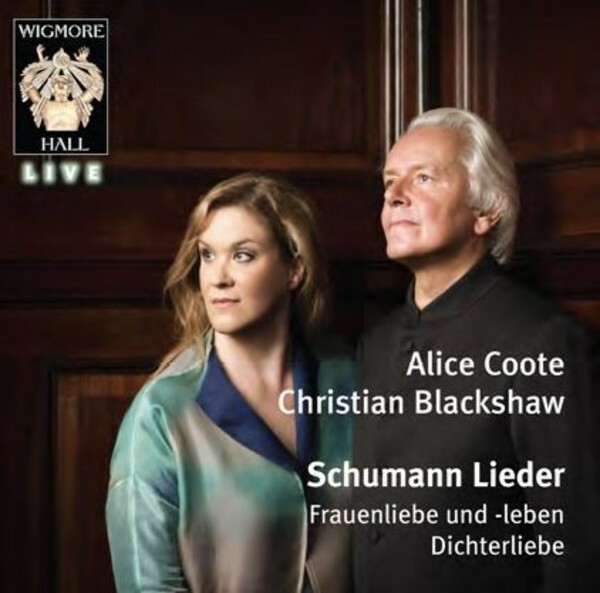 It's more than a decade since Alice Coote's first recording of Frauenliebe und -leben (with Julius Drake on EMI), but the benefits of a live account are immediately apparent in the pacing from song to song and the resultant expressive dynamism. From the hesitancy of first love to the numbness of bereavement, this performance captures the gamut of emotions in 'a woman's love and life'. The central songs are particularly memorable: the ecstatic inwardness of 'Du Ring an meinem Finger', the bustle of 'Helft mir, ihr Schwestern' and the exquisite tenderness of 'S�sser Freund' all mark this out as one of the finest accounts of this cycle. A mezzo-soprano singing Dichterliebe (A Poet's Love) may raise a few eyebrows, but there's a long tradition of female voices taking on this celebrated collection, including such artists as Lotte Lehmann, Suzanne Danco and Brigitte Fassbaender. Alice Coote has exactly the tonal strength and focus to succeed in winning over any doubters, dazzlingly secure at the top of her range, and richly expressive at the bottom. With Christian Blackshaw superbly responsive both to the twists and turns of Schumann's piano writing and to Coote's wonderfully nuanced singing, this is a performance which savours anew the composer's miraculous inventiveness. 'Die Rose, die Lilien' and 'Und w�ssten's die Blumen' are superbly light, 'Ich grolle nicht' imperious and impassioned without any heaviness, while 'Das ist ein Fl�ten und Geigen' has rarely combined dance and emotional bitterness to such devastating effect. The bleakness of the later songs makes its mark without exaggeration, a model of how this music should be. Schumann's setting of Goethe's Nachtlied makes a fitting and exceptionally beautiful encore. The balance between voice and piano is ideal, the recording quality as fine as we've come to expect from the Wigmore Hall Live label, and the audience exceptionally well behaved � no doubt captivated by the sheer quality of the music-making. A real treat for song-lovers everywhere.